Bill Frisell is our greatest living jazz guitarist. Thomas Morgan is the most gifted bassist to enter jazz in the new millennium. In the minimalist duo format of Small Town, Frisell's glittering, spellbinding sound and his bold imaginative acts stand clear. It was recorded in an optimal artistic and acoustic environment, the Village Vanguard, by A-list engineers James Farber and Paul Zinman. It is the next thing to being there. Most of the songs are tributes. Frisell often played "It Should've Happened a Long Time Ago" at the Vanguard with its composer, the late Paul Motian. For 11 minutes, Frisell lingers over the implications of the bare melody and single chord. His notes take forever to decay. Frisell says he felt Motian's presence in the room. "Subconscious Lee" was chosen because its composer, Lee Konitz, was actually in the audience. The tune's convoluted, syncopated head is faithfully rendered, then creatively abandoned. Frisell's hovering, elusive "Song for Andrew No.1" was inspired by drummer Andrew Cyrille. Two pieces acknowlege Maybelle Carter, "Wildwood Flower" and the title track, Frisell's original cowboy lament. Anyone not stirred by the lilting grace of Frisell's Americana music should see a doctor. He has redefined the genre for jazz. The most unexpeceted track, John Barry's "Goldfinger," is the kind of discovery only Frisell makes. Who knew how melodically and harmonically promising this James Bond movie theme was and is? Frisell repeats its opening three-note proclamation until it is a twanging ritual, an incantation all his own. Small Town represents the guitarist's first recorded encounter with Thomas Morgan in the intimate setting of a duo, the double bassist having first shown up on Frisell's film soundtrack homage, When You Wish Upon a Star (Okeh, 2016). As superb as When You Wish Upon a Star undeniably is, it's in the more naked, completely vulnerable environs of the duo—where the need for musical trust is, perhaps, at its most crucial—that the profound chemistry shared by these two thoroughly synchronized players becomes even clearer. Whether sonically reinventing chamber strings music or applying avant-improv to bluegrass and early rock, guitar pioneer Bill Frisell keeps on making music that could only be his. Another case in point: this almost psychically empathic duo set with New York bassist Thomas Morgan. Morgan’s quick anticipations of Frisell’s moves give their conversations a startling buoyancy; the weave of bell-like harmonics, quiet electronics and folk-blues figures is mesmerising on the Paul Motian tribute It Should Have Happened a Long Time Ago; Frisell’s Song for Andrew is like a Nina Rota movie theme; and the title track is wistful country-rock that drifts into haunting, ever-mobile dissonances. It all sounds as natural as talking or singing. 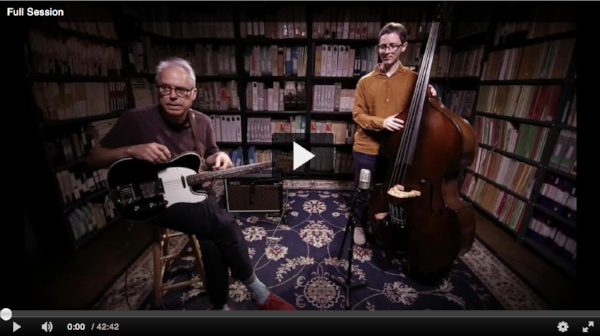 At some point over the last several years, guitarist Bill Frisell developed a rare intuitive bond with bassist Thomas Morgan. Their collaboration has extended to some of Frisell’s ensemble work, but the best evidence resides in the conversational duo format. This March the two improvisers played a week at the Village Vanguard, recording the gig for a sterling new album, Small Town, due out on ECM on Friday. As one might expect, the album moseys along a range of style, touching on a James Bond theme, an Appalachian folk song and a tune by drummer Paul Motian, who was a common touchstone for both artists. Here you’ll find the premiere of “Subconscious-Lee,” Lee Konitz’s contrafact of the Cole Porter standard “What Is This Thing Called Love?” — and a brilliant inducement for the duo to come out swinging.